This custom Android offers a near-stock experience, unlike Oppo's ColorOS, and targets the company's Western customers. Oppo has been working on its ColorOS custom Android for a while now, releasing multiple headsets loaded with it since 2013. While ColorOS offers many customizations, now they release another custom Android version, pushing things in a completely different direction - Project Spectrum aims to keep the user experience as close to stock Android as possible. According to the official press release, Project Spectrum "continues OPPO’s commitment to listening closely to users’ needs and will allow OPPO to even better connect to consumers in Western markets." While this Android version has the speed and fast updates one would expect from a pure Google Android release, it also features PureImage 2.0+, MaxxAudio, and screen-off gestures - most popular attributes of ColorOS. Oppo Find 7 and Find 7a are the first two handsets to receive the Project Spectrum option. This firmware is based on Android 5.1 Lollipop and can be downloaded directly from the Oppo Community website. 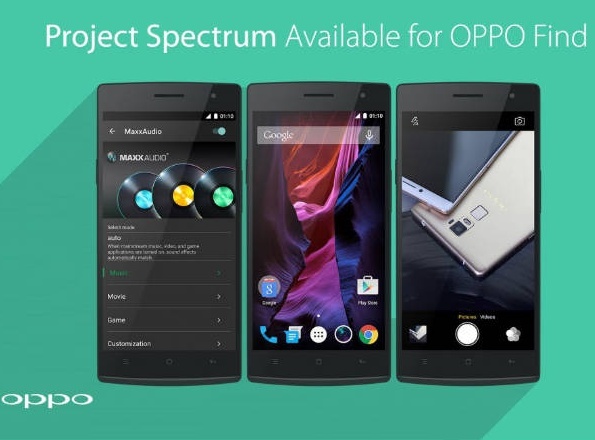 Oppo R5 and R5s will get Project Spectrum firmware soon as well but still based on Android 5.1. Android 6.0 Marshmallow-based Project Spectrum will come in early 2016. For more details, please check the press release below. Shenzhen, Nov 18, 2015 – The ever-evolving global smartphone brand OPPO is rolling out a near-stock Android alternative to its popular ColorOS that will allow users of key devices to choose a clean-cut Android experience without sacrificing ColorOS’ most beloved customizations. Available as a direct download from the OPPO Community website, the new operating system, called Project Spectrum, continues OPPO’s commitment to listening closely to users’ needs and will allow OPPO to even better connect to consumers in Western markets. Starting in 2013, OPPO included ColorOS, a highly customized Android ROM, on all of its smartphones. ColorOS’ robust set of features as well as its sleek and friendly design have been well received by users around the world. But OPPO prides itself on listening to what users really want, and there is a significant group of smartphone enthusiasts, particularly in Western countries, who prefer software that stays closer to Google’s original vision for Android. It is with their enjoyment in mind that OPPO is expanding the software options for key devices. With Project Spectrum, users will experience all the oft-cited benefits of near-stock Android: speed, lean design and faster updates. But they also won’t lose the most widely loved ColorOS features, including industry-leading imaging and audio enhancements (PureImage 2.0+, MaxxAudio) and screen-off gestures. OPPO users will have a wider spectrum of choice, and whichever path they choose will bring a full spectrum of features. The widely loved Find 7 and Find 7a are the first devices to receive the Project Spectrum option, with a version based on Android 5.1. Find 7 and Find 7a users can directly download Project Spectrum from the OPPO Community website, and then follow a few simple steps to install it. Versions of Project Spectrum for the R5 and R5s, also based on Android 5.1, will follow soon. Meanwhile, a version of Project Spectrum based on Android Marshmallow is expected to be released for other key devices in early 2016. Warranties for devices sold over oppostyle.com or Amazon in Europe, which mostly serve Western customers, will not be affected if users choose to switch to Project Spectrum. Customers who bought their phones anywhere else, such as offline stores in Asia, Africa or Latin America, should consult their local resellers for more information about warranty policies. As always, OPPO product managers expressed their encouragement for community engagement, and said that Project Spectrum will make incorporating user feedback into future software updates even easier. Meanwhile, for users who prefer a superb, hassle-free experience straight out of the box, ColorOS will continue to be supported as the default system for all OPPO phones. But OPPO doesn’t stop there. Using our passion for design and commitment to new technologies, OPPO has made a big impact in the audio-visual market by offering world-renowned, premium Blu-ray players in the United States and across Europe. For more information, please visit www.oppo.com/en/.